Diggers Valley: 13 November 2010. The week beginning the 13th of November 2010. We ran away into the hills this morning. 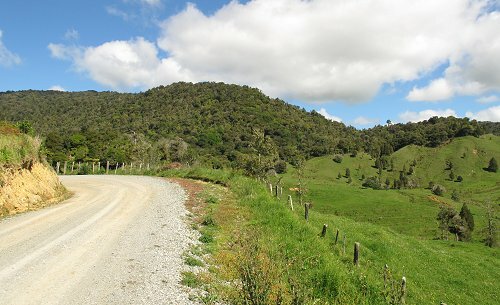 Actually we drove up the road for a few kilometres, parked the ute and then walked. 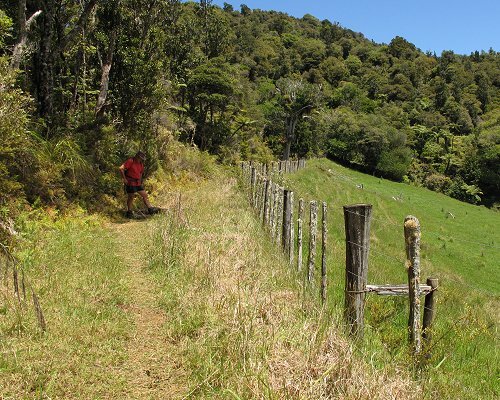 This is one end of the Kaitaia Walkway, sometimes still known as the Kiwanis' track, because it was that community group which did so much of the track work, including construction and maintenance of the bridges and the upkeep of the camping buildings at the other end, at the top of Larmer Road. When we'd walked for about fifteen minutes along the edge of the farmland, we looked back to see how far we'd come. The red dot indicates where we parked the ute. 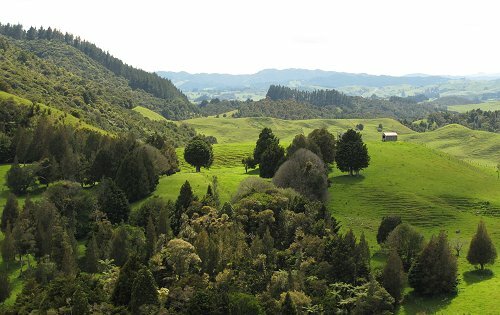 A little further on I took this picture looking back towards home: those Pine trees in the middle distance in the centre of the picture are ours, with the big plantation going up the hill to the left being the Juken Forestry trees behind our place. The shade in the forest, after the walk in the hot open sunshine, was lovely and cool! This view struck me as particularly pretty, with the Parataniwha (the pink tinged leaves) growing down from the base of the tree trunk, under which we passed. 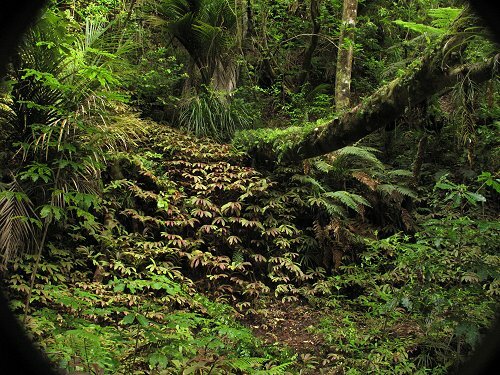 I came looking for orchids, but hadn't been thinking about any but the particular species I wanted to see, and suddenly all around us were these lovely greenhood orchids, at ankle height. 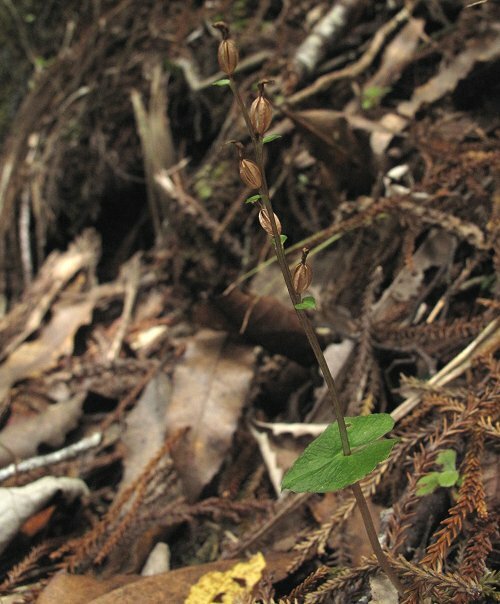 This is Pterostylis banksii, Tutukiwi. Here also were the tiny orchids I first saw over the hills on another of Stephan's trapping walks a few months ago: Acianthus sinclairii. The ovaries have matured and shed their seed to the winds. 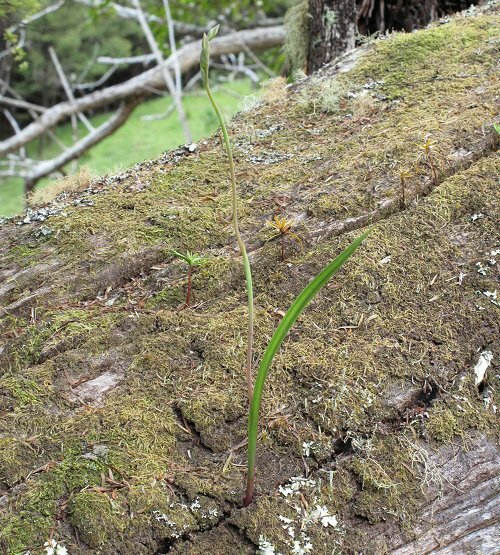 On an open clay bank I spotted the first Sun Orchid plant, long before we reached Stephan's lunch rest area. 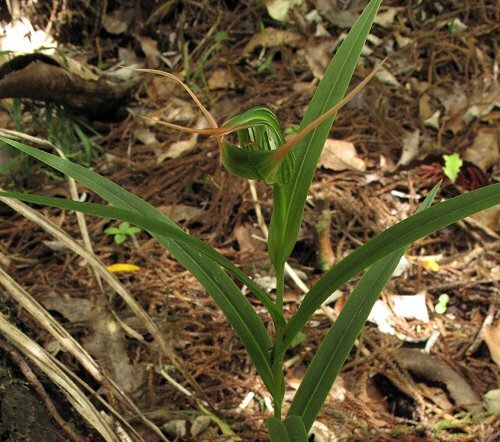 It was a robust plant, probably at least three years old, growing alone - there was evidence of much pig rooting around the area, so if there were other plants, they were no longer growing there. 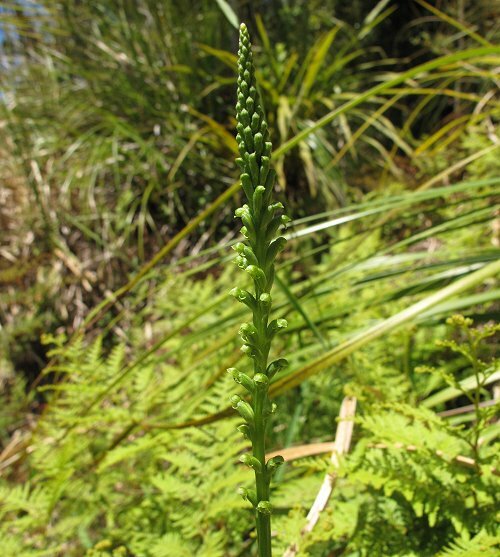 But that plant, even in its warm, sunny position, was not yet in flower. 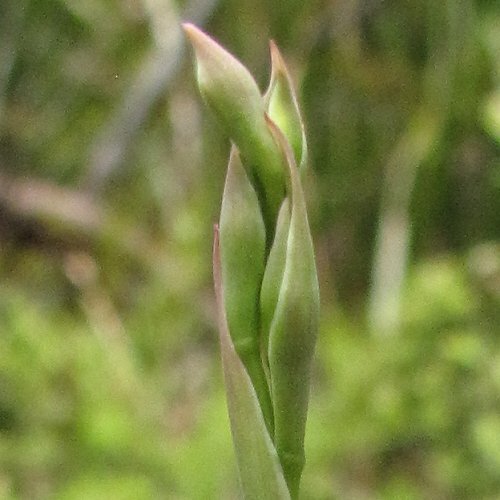 When at last, after a two hour trek, we reached the area we were looking for, we found a number of small plants growing separately in a grassy open area, all with flower buds not yet ready to open. Their later flowering time would suggest they are not the same as our orchid at home. They may be of one of the parent species though. Having "got my eye in", or attuned my vision to orchid-spotting, I saw more and more of them on our way back. There are loads of these onion leaf orchids growing wherever I have found any other sort of orchid species. Even down in the middle of the grassy track, where cattle have obviously sometimes been grazing, there were Sun Orchid plants. We had walked over the top of them without noticing, on our way in. I want to try and get back to see these ones in flower, if I can. In the picture, Stephan stood with his foot indicating the position of one plant, so I might find my way back to it later. Having now seen how far behind our garden plant the wild populations are in flowering, I thought I'd look around the farm a bit more carefully for the sort of plants we'd seen up near the bush. Out in the Middle Back paddock where the cows and calves are presently grazing, there is a fallen Puriri and there on the trunk were four orchids; two with flower buds, one which had been dinner perhaps for a possum, and one which was quite shrivelled, perhaps not growing in quite the right spot for such a dry year. 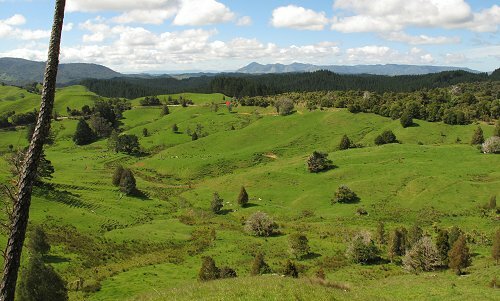 The NZQA (New Zealand Qualifications Authority) secondary school exams began today, so now Stephan takes over most of my farm duties and I go off to terrorise teenagers! This is my fourth year and things run more smoothly every season as I gain experience. I'm gradually building a really good team of supervisors, which also makes things easier year by year. In an exception to usual practice whereby I refuse to receive visitors or guests during the exam period, we allowed Mary-Ruth to invite herself to stay for a few days while she does a locum job for one of the vets. I'm much less tired and stressed by the exams this year and really enjoyed having quietly social evenings after the days at school. We did some pond-side exploration this evening, with my nice torch. 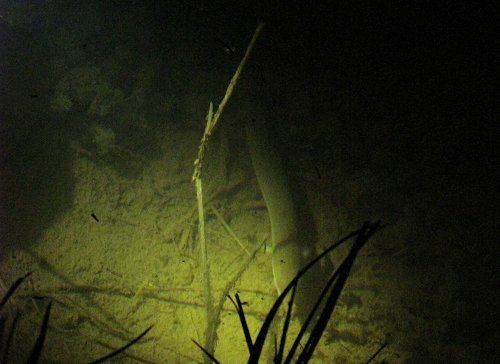 Many of the water creatures are nocturnal, so the pond can appear quite empty of interesting large lifeforms during the day, but at night the fish and the eels can be seen. The rest of the week passed for me in a flurry or exam papers, with verbal farm reports from Stephan.